Elanee's Endeavors ! : Exciting News! As I promised I have some news to share with you all that will hopefully be as exciting for you to read as it is for me to share. For the past few years I've been exploring the possibility of being an affiliate for a company. After trying out several options, I found out that the Home Educating Family Association had an opportunity for new affiliates. I've been familiar with HEUDA for a few years since I've enjoyed using their "On the Go" planners for my daily routine. After looking into their affiliate program, I decided to join, and have slowly worked into the advertising process. (You may have noticed the ads on the side of my blog recently) From the moment I found out about HEUDA's affiliate program I was very excited, because I knew that they were a company I could be proud to support, as I just love their products. After I read "Get More Done in Less Time" by Donna Otto, I had been on the lookout for a journal since she suggested a journal as a great way to keep your schedule, and life organized. While we were at a homeschool conference a few years ago, I was excited to stop by the Home Educating Family Association booth, and was even more excited to find their "On the Go" planner which was exactly what I had been looking for. From the pastel colored pages, daily scheduling section, easy to find tabs, and reminders section, to the encouraging Scriptures, and inspirational quotes on each page,I knew this was just the planner to meet my needs. It has turned out to be a wonderful hassle freeway to keep everything from my thoughts, to daily plans, to gifts ideas for friends, well organized, and in an easy to find place. 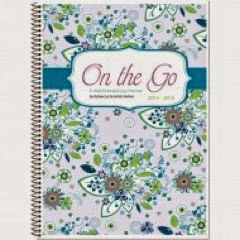 If you are struggling to find organization in your daily routines, or simply need a place to jot down your to do lists, I would highly recommend the "On the Go" planner from HEUDA. 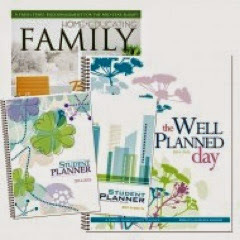 Perhaps you're in high school, or just starting college...HEUDA has just the planner for you. There are a lot of great resources from HEUDA to meet all your scheduling and planning needs, including some great resources for busy moms. I encourage you to check out their website for more information. Today I am very excited to announce my first ever giveaway for Elanee's Endeavors. 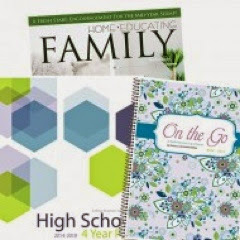 Starting today until April 30th you and your friends have a chance to win a free "On the Go 2014-2015" planner from the Home Educating Family Association. You can enter the giveaway each day and you'll also get more entries for sharing this post on your blog. Also please be sure to check out the HEUDA website, and get familiar with their excellent products. And if you end up purchasing something, please let me know how you like it! Here's a passage of Scripture that has recently been inspiring to me and has encouraged me to keep my focus on God. I hope it inspires you today! What a great God we serve! I love your honesty about what God has been teaching you, and would love to see more of your poetry and what you're doing on a daily basis! I like your focus on God's Word. I would like to see some of your music! I love hearing news about your life and reading about what God is teaching you! More of those things, maybe? I love reading your poems - I try my hand at it and enjoy it, but I could always learn more. I really appreciate how you share very genuinely to all of us - it is encouraging to us to do the same. I love how you share the things God is showing you! You may not always know it but sometimes it is something I have been struggling with too and it helps me so much!! I think I would like to see more pictures with your posts. Hi Elanee! Just discovered your blog and have greatly enjoyed reading through it! 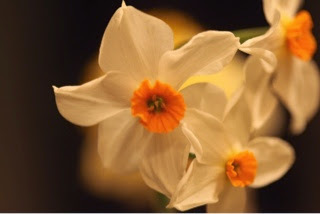 Hope you will come, check out my blog and follow! It's great that you are focusing on God! Thanks!